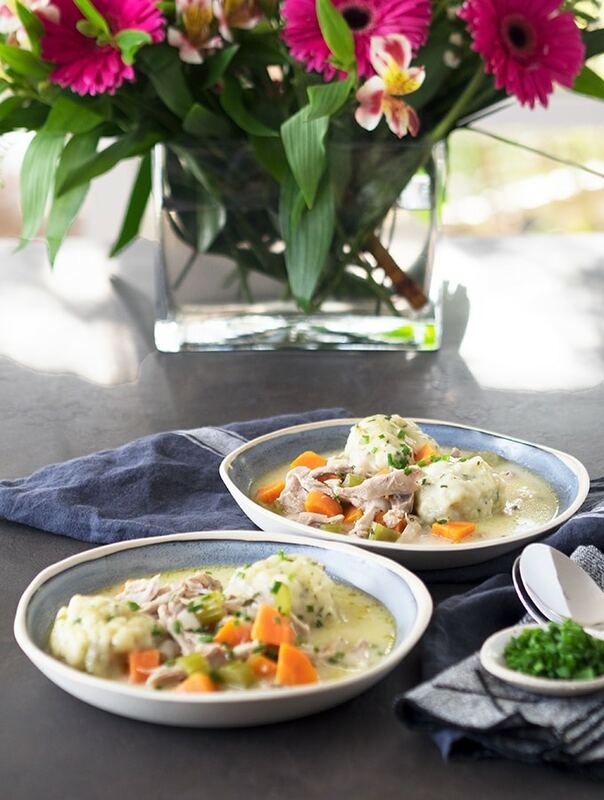 A hearty one pot chicken and dumplings recipe. 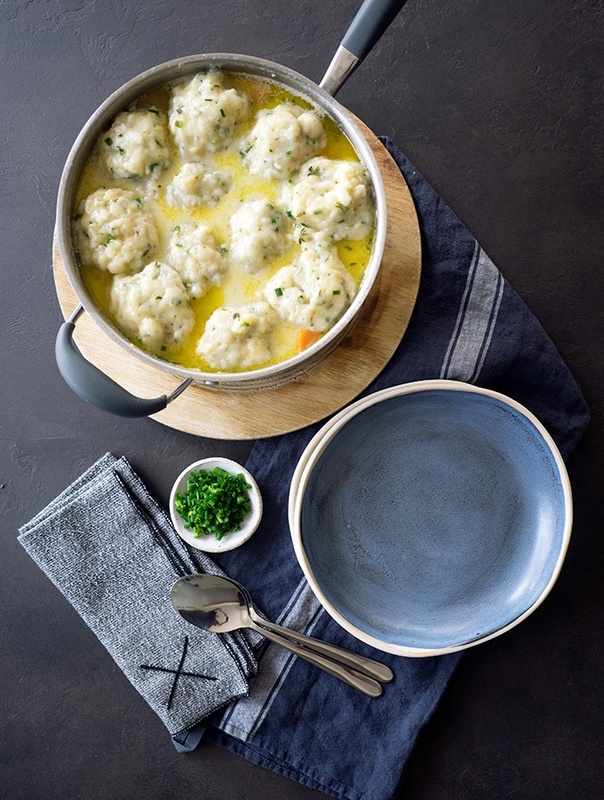 A creamy soupy chicken stew topped with chive and tarragon buttermilk dumplings. I do love a true to goodness one pot meal. The type that you can take from the stove and place on the table to feed your tribe. Serving straight from the pot into bowls clasped by hungry hands. 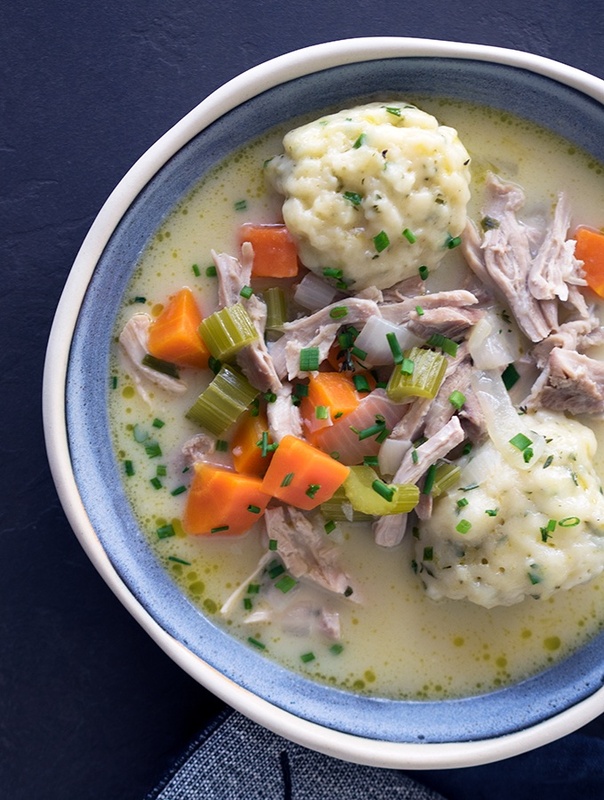 You guessed right, this one pot chicken and dumplings is such a recipe. Everything is cooked in the one pot. You start by gently poaching chicken thigh fillets in chicken stock. If you have homemade stock in your freezer, this is the perfect time to whip it out. With thigh fillets cooked and removed, and stock strained from the pot it is on to the rest of the ingredients. Then the vegetables are added to the pot and sautéed in butter. Aromats follow with the chicken that has been shredded some cream and the stock. Then you gently place your rustically formed ball of dumpling dough on top of the chicken mixture. Lid on and it is left to cook and the dumplings puff. Often I have been tempted to serve with crusty bread on the side. But that would just be carbs on carbs and as tempting as it is, really isn’t needed. The dumplings do puff up beautifuly, but they are still dense and quite hearty. I find they are more than adequate as an accompaniment to the creamy chicken stew. All the liquid seems to get sopped up quite nicely. You will need a large cooking pot which has a lid. A 5 litre pot (1.3 gallon) pot would be perfect. It may seem a little big, but once you add the dumplings the chicken mixture will start to bubble up. The lid is important to help steam and cook the dumplings. You’re in luck, no special ingredients. This is an easy to source ingredient kind of one pot wonder. In the fridge: Leftovers will keep in the fridge in an airtight container for a couple of days. Place dumplings and chicken mixture in a pot and slowly heat to a hard simmer and serve. Freeze: Leftovers can be frozen. Defrost and then place in a pot to reheat. Bring mixture slowly to a hard simmer and serve. This dish is a serious hug on the inside on those cold winter days. Place chicken stock and whole thigh fillets in a large pot with lid. 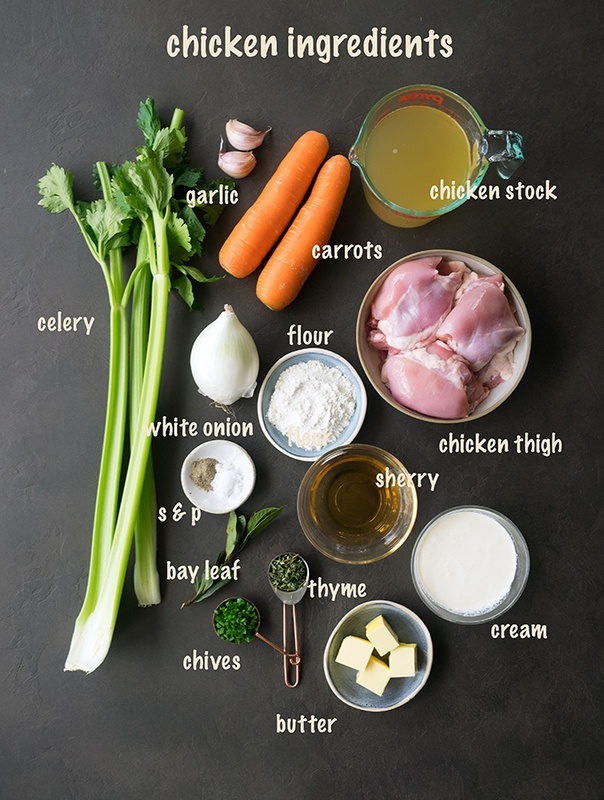 Bring stock to a simmer and poach chicken. Remove chicken once cooked and set aside. Strain stock into a into a heatproof bowl and set aside. Add butter to the pot and melt over a medium heat. Add carrots, celery and onion, cook for a couple of minutes. Then stir in flour. Gradually stir in warm stock. Add garlic and bay leaf, then place lid on pot and simmer for 10 minutes. While vegetables are simmering shred chicken thigh fillet and make dumpling mixture. 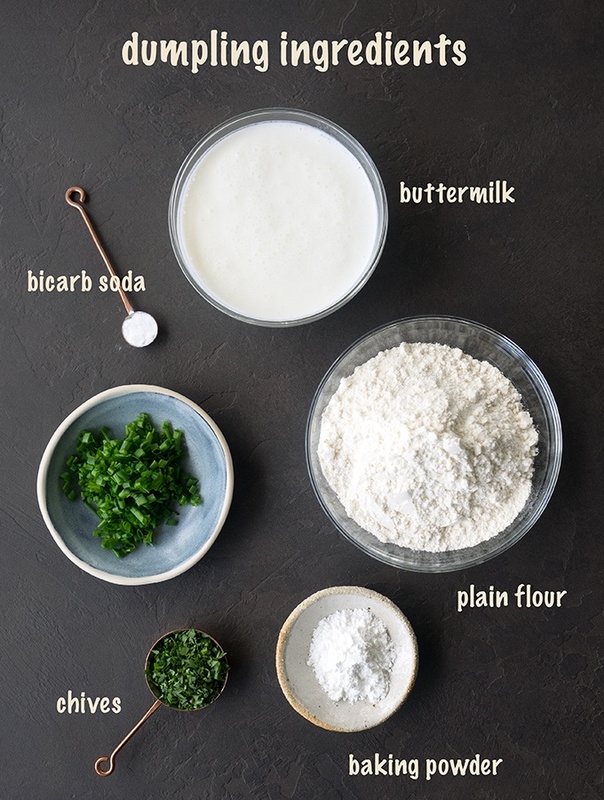 To make the dumpling mixture place chive, tarragon, flour, baking powder and biacarb soda in a bowl and mix. Add buttermilk and mix until combined. After 10 minutes add sherry, cream, parsley, thyme and salt. Stir well and then add the shredded chicken. Season mixture with salt and pepper to taste. Spoon dollops of dumpling mix into your chicken mixture. Then place lid on the pot and simmer for 20 minutes until dumplings have cooked through. Divide mixture between bowls and serve with a good sprinkle of freshly chopped chives. « Duck Larb Recipe + why can we eat pink duck meat? We definitely enjoyed the dumplings. It is so delicious. this is now part of our favorites list. Thank you for sharing the recipe. 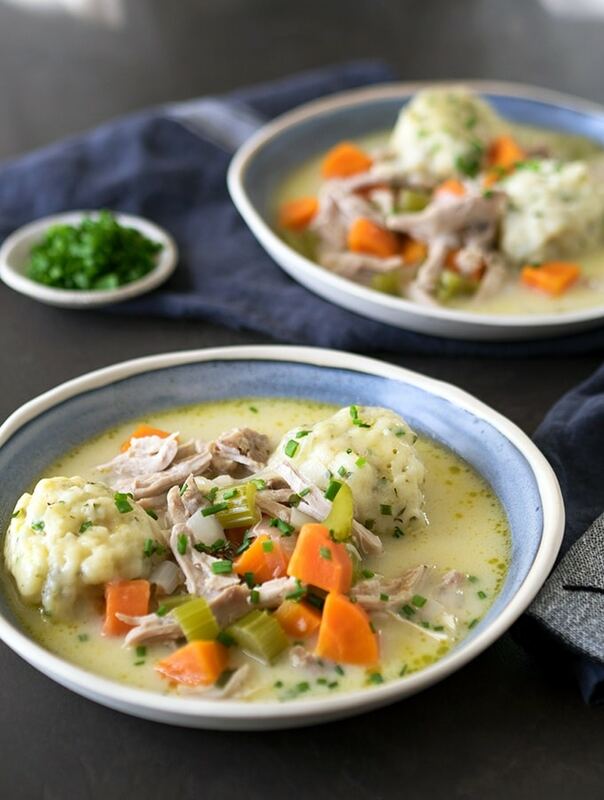 The dumplings looks delicious and the recipe looks so comforting. I loved the ingredients shot!! wow! Love the way you have taken the effort to click those ingredients and shared a detailed recipe. These one pot meals are so handy! YUM! 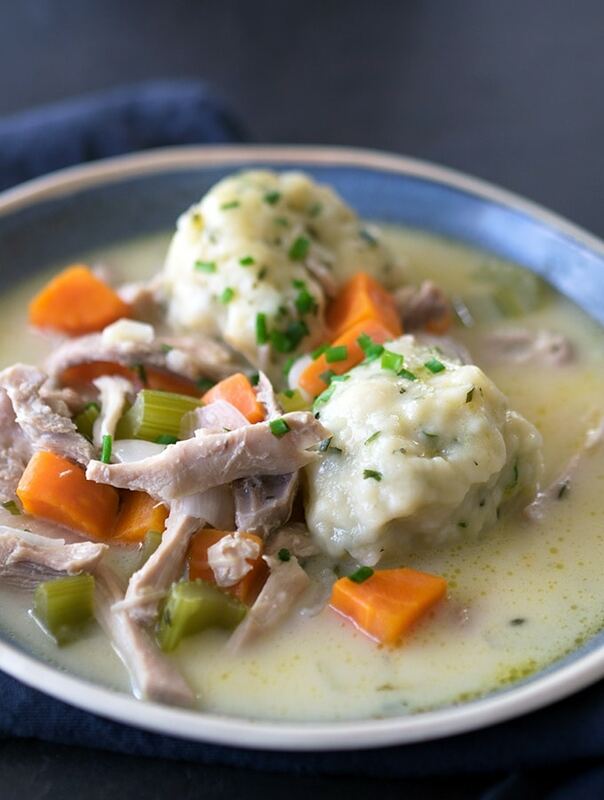 These dumplings look so delicious and I love how easy it is to make them. Delicious! This look so lovely and comforting. Love dumpling, I can’t wait to give this a try. I love dumplings, they were ever present on our table growing up… I adore that they are pretty universal with different varieties appearing around the world. These sound and look superb!